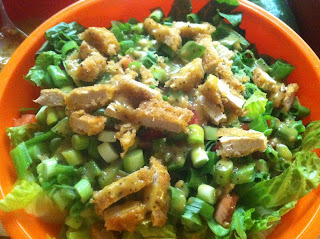 The Bad Kitty Bakery: Madelyn's Magical Dressing with RECIPE! Madelyn's Magical Dressing with RECIPE! When I became vegan, I needed to change the way that I ate. I got rid of many of the old, bad things I used to eat and sought out new alternatives. One of those things I found was my favorite salad dressing. It was a miso mustard Dijon. It was sweet, tangy, and wonderful. It felt alive and though I was broke, and it was $5 a bottle, I bought it by the case. You have never seen anything as sad as the poor UPS man lugging a heavy, heavy box up to your door, wanting to know what was inside, and you tell him it is salad dressing. I think I destroyed two people’s souls doing this. For over 5 years, I have tried to recreate that recipe. One year ago, they changed the formula. It was no longer ‘my dressing’ but some foreign stuff that was not the same. It didn’t have the same magic that made me pour dressing over salads, dip raw cauliflower in it, and have to really fight the urge to just drink it by the sweet, sweet glass full. Then, last night, a miracle happened. I decided to make something close, because I wanted to munch on some cauliflower and I didn’t have any type of dressing. It had been a year since I tried to crack the recipe code, and this time I was not really trying. I just was trying to come up with something good. I made it exactly. And I do mean exact. I even figured out the calories and it was exact, which makes me think I might have cracked the company formula. Now I can make it myself, it is fresh and delicious. I also cleaned out a balsamic bottle that was almost empty so I will even have a pretty bottle to store it in. Yay! If you also love tangy sweet salad dressings, here is the formula. Combine and whisk until smooth. Store in the refrigerator after creation. One TBSP has 45 calories, but adds a LOT of love to salads and raw veggies.